Alan Dunch, Garry Madeiros and Denis Tucker are the designate Gaming Commissioners, Minister of Tourism Development and Transport Shawn Crockwell said today [Feb 11]. “There are still two remaining appointments to be made, but in the interest of getting the Commission up and running as soon as possible so that we can expedite the introduction of Resort Casino Gaming in Bermuda, I have decided to proceed now,” Minister Crockwell said. “As for the two remaining appointments, one will come from overseas and be a former Gaming Commissioner with anti money laundering experience. “The Commission will be tasked with regulating the industry and ensuring compliance and best practice at all times. The Commission will be the only entity that will determine who receives a Casino Licence and the transfer of a casino license without a fresh application to the Commission will be prohibited and license holders are required to report any material changes in their circumstances. “The Commission will also have power to approve the layout of a casino, gaming equipment and hand out licenses for key casino employees. “It is crucial that the designate Commissioners start the training process so that the Commission is in a position to consider applications for Casino Licenses as soon as practicable. That is why I have decided not to wait before identifying the full Commission. In December of last year, Parliament approved the Casino Gaming Act 2014. 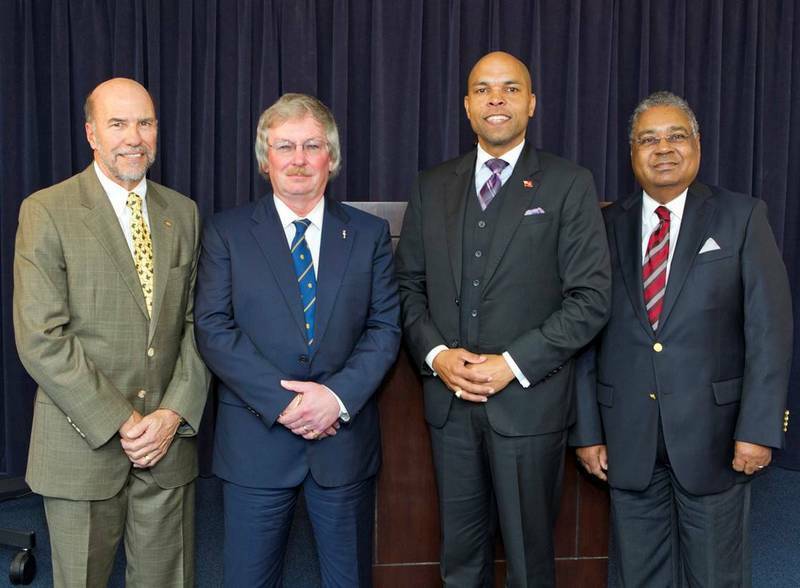 This Act makes provision for the creation of a Bermuda Casino Gaming Commission that will be made up of five members, including a chairman who has to be a barrister with more than five years’ experience. Today I would like to announce the designate Gaming Commissioners that I have identified. They are Mr. Alan Dunch (Chairman), Mr. Garry Madeiros (Deputy Chairman) and Mr. Denis Tucker. Let me take this opportunity to give you a little background on these gentlemen. Mr. Alan W Dunch, JP is the Director responsible for the litigation practice group of MJM Limited. He has over 35 years of legal practice at the Bermuda Bar, and has developed specialised skills and expertise in the areas of labour and employment disputes, telecommunications and regulatory law, planning law, hospitality law, corporate and commercial litigation and insurance litigation. Throughout the course of his career, he has appeared regularly before the courts of Bermuda at every level as well as in the Privy Council on numerous occasions. Mr. Dunch has extensive arbitration and overseas jurisdiction experience and provided expert evidence on Bermuda law on a number of occasions. In addition to practicing before the courts, he provides business, labour and general advice to clients both locally and overseas. He also sits on a number of boards of directors and involves himself in private client advisory and trust work. Mr. Garry A. Madeiros, OBE, JP, FCA is the retired(2007) President & Chief Executive Officer of BELCO Holdings Limited (now known as Ascendant Group limited), Bermuda Electric Light Company Limited and Bermuda Gas & Utility Limited. He had worked at BELCO for twenty-two years and the last 14 years as President and CEO. Mr. Madeiros, a Chartered Accountant, has served on a large number of corporate, community and Government boards and is presently the Chairman of the Sustainable Development Round Table. For his contribution to the Chartered Accountant Profession and the community he was awarded a Fellowship from the Bermuda Institute of Chartered Accountants in 1996 and for his contribution to education and the community he was awarded a Fellowship from Bermuda College in 2002. He was appointed a Justice of the Peace (JP) in 2002, and made an Officer of the British Empire, OBE, in June 2011 for his seven years as Chairman of the Defence Board. He was the first and only civilian Chairman. Presently he is a Director of BF&M Limited, Chairman and Director of BF&M Life Insurance Company Limited and Director of Utilico Emerging Markets Limited, an exempted close ended Bermuda Investment Company that invests predominantly in infrastructure, utility and related companies in Emerging Markets. Mr. Denis Tucker is currently the Chief Executive Officer of the Hotel Pension Trust Fund. Prior to that he served as the Vice-President and Managing Director of Sonesta International Hotels Corporation. Mr. Tucker spent 27 years with the Sonesta Hotel and he also served as a Common Councilor and Alderman for the Corporation of Hamilton from 2009-2012, he served as a Director for the Bank of Bermuda from 1995-2012, and he is presently a Director of the Bank of Bermuda Foundation. There are still two remaining appointments to be made, but in the interest of getting the Commission up and running as soon as possible so that we can expedite the introduction of Resort Casino Gaming in Bermuda, I have decided to proceed now. As for the two remaining appointments, one will come from overseas and be a former Gaming Commissioner with anti money laundering experience. The Commission will be tasked with regulating the industry and ensuring compliance and best practice at all times. The Commission will be the only entity that will determine who receives a Casino Licence and the transfer of a casino license without a fresh application to the Commission will be prohibited and license holders are required to report any material changes in their circumstances. The Commission will also have power to approve the layout of a casino, gaming equipment and hand out licenses for key casino employees. It is crucial that the designate Commissioners start the training process so that the Commission is in a position to consider applications for Casino Licenses as soon as practicable. That is why I have decided not to wait before identifying the full Commission. I remain confident that resort casino gaming is right for Bermuda and that most Bermudians supported the legalisation of gaming in Bermuda. It is now imperative that we put the right regulatory structure in place to ensure that we create a responsible and highly respected gaming industry in Bermuda. No “common folk” here! Pay attention people. Umm, these are the regulators for the casino sector. Not sure what common folk has to do with anything. smh is just trolling. Trying to make this look like its some grand, giant, evil conspiracy. Ignore it. @smh – let me get this straight you want “common folk” to head a gaming commission? You would rather have a person with zero management, accounting and business sense calling the shots. Wow! You need to go back to school and pay attention this time. THat is not how it works in the real world. Sorry if you were part of the friends and family group that cost us millions in payouts / handouts but those days are over. We are broke because your former government friends gave away our monies. The MANIFESTATION off JETGATE !!!!!!!!!!!!!!!!!!!!!!!!!!!!!!!!!!!!!!!!!!!!!!!!!!!!!!!!!!!!!!!!!!!!!!!! Is this a paid role? If so how much? I would think that the commissioners would need to be paid, especially since you are trying to attract experienced overseas regulators. However, I am sure casino license fees will pay for the operational expenses of a regulatory body…..same as the Regulatory Authority and Telecoms. However, in the spirit of transparency salaries should be made public. @BT checker, don’t know if it is a paid posistion but I can you this?? It is obvious you are a plp troll by the mere fact that you can’t spell your own name correctly twice?? And let’s not forget the character pics that are associated with your posts??? I can only assume you are a newbie at Alaska hall??? No I am not, quite the opposite. Check my other posts on other topics. i sent the second one in a rush as i thought the first didn’t go through. Kangoocar is one of the $350,000 paid bloggers. Well I guess you are the dumb ***, the money was distributed through groceries, rent, BLOGGING, verbal persuasion, etc, etc. BT is using different email accounts hence the change in avatars. Can’t wait to go all in! Hopefully we can host some televised poker tournaments as they do in Bahamas etc. So does this mean I don’t have to jump on a plane to see some eye candy and make it RAIN !!!!!!!!!!!!!!!!!!!!!!!!!!!!!!!!!!!!!!!!!!!!!!!!!!!!!!!!!!!!!!!!!!!!!!!! I hope they ban Bermudians from entering the casinos! We don’t need to throw our hard earned money down the toilet! Kathy, what gives you the right to say what other Bermudians should do with their hard earned money?? I for one don’t gamble and will not do so in the casinos, but I will NEVER tell someone else what to do with their money!!! I say it will be a disaster for the casinos if Bermudians were not allowed to enter them!!!! And do we patronise the locals and say they cannot enter liquor stores and pubs too?! Much as I dislike gambling and the seedy side of it that preys on the addict, you cannot control this. When you say Bermudians, does that mean ALL or is that just subliminal. Feel free to avoid going to a casino. That is your right, but, others have the same right to go into the casino. Is that difficult to understand? I saw an article about the islands inability to come out of the recession and something need to be done fast because we have no one to rescue us. Well this is one step in the right direction. Get your shovels out and come up with more ideas to restore Bermuda to its former glory! Many studies have shown that Gambling does very little for financial good of a community. If it does just a little good, its a start. If it provides some jobs, its a start. If it gives our visitors something to do, its a start. If it helps get even a few tourists here, its a start. If it helps to subsidize the cost of entertainment, its a start. If it helps to subsidize the cost of hotels rooms, its a start. If it helps generate some construction jobs, its a start. Is anyone expecting this to be the magic cure for all our ills – NO! There is no ONE thing the BTA , OBA or PLP can do to turn things around. However, if they do many different things that all contribute a bit, we will start to turn the corner. @ concerned parent. I totally agree. For the life of me I cannot understand why the OBA Govt does not commission the revenue equivalent of a SAGE. RAGE Bermuda. Revenue And Growth Exercise for the island of Bermuda. Put all of our collective ideas together as a nation wide think tank. Schools alike. Create contests as they did for the SAGE. Everyone can contribute together towards this national emergency in a bipartisan fashion. Emphasize that no idea is a bad idea to encourage full participation. If we keep ridiculing the ideas that do come from the BTUC for example we get nowhere but frustration and frustrated people. Let’s change the formula against soley vilifying the civil servants who have contributed which will never be enough for the naysayers no matter how much the cuts or furloughs are or may be. They are still civil servants it will never be enough for them. In my mind it goes much deeper than that but that’s another debate. Does the Govt have the vision and foresight to lead this equally important task rather than concentrating on knee jerk across the board cuts? Well it does not take a rocket scientist to determine whom will get a licence. Sure as hell won’t be the new hotel in St. George or the old Sonesta. Rick Olson must be really pissed. Unless it’s going to be Casino Royale style or Sun International Atlantis style this is jsut another case of small time, bucket shop local concessions. If you do this then think big, and go abroad for new investment from large international operations. Plus gaming is not a panacea. Cruise ship persons won’t spend money to go to these places and we only have 28 people coming off planes a week. We are sooooooo far behind the real world where gaming and gambling is a dying pass time, look at Atlantic City, gaming is on the decline and here we go thinking people are going to flock to our shores to play blackjack, really?.that boat sailed 10 years ago guys. Gaming is not dying! What has changed is that gone are the days when you had two choices for Gambling – Vegas and Atlantic City. Now most US states and Canadian Provinces have 5 or more large casinos and resorts. Casino Gaming is BIGGER than ever, not declining. AC and Vegas are suffering because because people have choices now. Ever been to a Casino in a major US City? They are usually packed with people gambling, dining, drinking and there for the entertainment. Ever taken a cruise before. If you did chances are you visited the packed casino! If gaming is dying then why did New York City decide to put a casino near JFK? would like to see someone on the committee with a background in gambling addiction treatment. ok so…where are these bermudians that are gonna be hired to fill these soon to be casinos training camps held at..?…i mean im sure that the proper casino etiquette is being taught right now as we speak..? and i say this because…i have seen FIRST CLASS. Bermuda HAS to be BETTER than First Class…can you do it bermy? can you steal a few billionaire Yachts’ from out of Monte Carlo..? Boutique gaming set in the right style in line with the size of our hotels will be a great amenity for Bermuda. For those that think the Bellagio is coming to Bermuda – it is not. The Minister has said initially 3 licenses will be granted. There will not be a NEW hotel built here and opened for at least 3 years. 2 years if they started building tomorrow. So I would hope that the Greens and indeed the Fairmont Southampton get due consideration ASAP should they apply for a license. That would leave one license for any new hotel build. The Government can always review any additional licenses should the need and demand be there. p.s. On a separate issue, the hotels of Bermuda need to step up to the plate and INVEST in presenting entertainment properly that includes proper staging, sound & lighting. Every cruise ship sailing to Bermuda have fantastic rooms for entertainment. It is time the Bermuda hotels stepped and invested like they do with SPAS, TENNIS COURTS, SWIMMING POOLS, DINING ROOMS etc. Um is the other underground perks coming with it, hopefully, cause this Island is BORING. There is a completely different council to address problem gaming. Each of these men have well respected professional track records. I hope the other local appointment is a woman for balance and diversity. So far it is a very good start. Congrats! And I like Dennis Tucker. He’s proven to be a great leader!! I agree and Gary is a straight up – good leader and smart businessman. I don’t know Alan personally so I can’t comment on him , but he is in good company and I’m sure he too is a no nonsense straight up guy as well. more money being pumped into tourism…why isn’t the bta in charge of this? they seem to have alot of extra money to play with already, these gaming commissioners are to examine the industry and find a suitable model for bermuda, but as you will recall, crockwell already went to singapore and had approved that model as the one for bermuda. we paid for all that galavanting previously, yet we are shelling out more to do the same thing again? too much bad deals and corruption[jet gate]now they are basically setting up another private entity to fulfill the responsibilities of government. why do we need these clowns again? Goverments three new frontmen……sigh.Must be getting paid a poopoo load to take the licks they will be facing. They are all in on it. These three gentlemen are seasoned professionals. I have had dealings with each of them separately, and I would trust the to do a good job. Friends and family on the government payroll !